High season really is here. Busy. Can't... update... too... often... No need to update every day really, weather is 95% guaranteed to be hot and sunny, with a slight cooling NE wind - over the weekend the NE winds really started and at least one dive boat had to change plans due to choppy seas. Much calmer now, and with the wind not blowing the clouds away we have had some light rain the last few nights. Yesterday was His Majesty the King's Birthday. 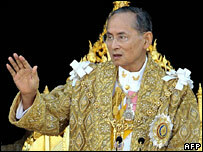 King Bhumibol Adulyadej is 80 years old and has been 61 years on the throne - beating Britain's Queen Liz by 6 years. Long live the King. Phuket Weather Live Update - 4:44pm, 6th December - light rain is falling here at Karon Beach. 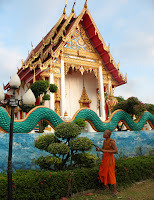 Yesterday I finally took some time to look at Karon Temple. The blue sky in the photo clouded over soon after and we had some rain around 7pm last night. New Live Update... 4:51pm, sky is brighter, rain has stopped.. barely enough water in that shower to make the trees damp. If you want to see what the weather is like now, check out this Karon Beach WebCam.